While looking through the thumbnail photos, I spotted several items of interest, and so I clicked through to them. After browsing through the items, I was struck by how many of the listings did not show a shot of the label. In most cases it really did not matter because I could tell if the item matched the seller’s estimate of the age of it. But there were several cases that I honestly could not tell if the item was from the 2000s or the 1970s or the 1950s. There have been so many vintage styles copied over the past 15 years or so that it takes more than a few photos to get a feel for the item. And all it would take is one glimpse of the label and the mystery would be solved. If you are an online seller, and you always show the label, thank you. If you don’t, then I hope you will consider fitting in label shots on all your listings. It makes shopping easier, and easier shopping leads to more buying. To further flog this horse, I’ll use White Stag as an example. The top label is from 1955. White Stag used a form of this label, and a similar red on white one, in the 1940s and 50s. This label is from the early 1960s. This label is from the late 1960s and into 1970s, and is probably the most commonly found vintage White Stag label. Note the change in the font. Regardless of what numerous etsy and ebay sellers would want you to think, this is not a vintage label. 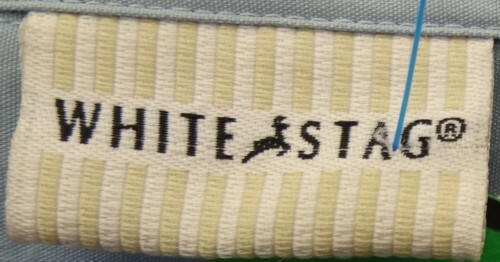 It is the label used by Walmart in their White Stag line. Amen. I have to see the label, period. You are so right. Really, there is no call for *not* showing the label; even being limited to 5 photos as on some sites, it’s not that difficult to superimpose a small picture of the label in the corner of another photo if 5 truly are necessary. I hope many sellers see this post of yours and reconsider this seemingly minor act of neglect! When I sold garments on-line, used Photoshop to increase the number of photos. In Photoshop you can place multiple photos on one canvas, that then is considered one image to upload. It allowed me to shop off details, labels, and flaws. Seriously, sellers, get yourself Photoshop. OK, here I go with my own take on this topic: as an Etsy seller I need those, 5 pix because I use — 2 square compositions of the front views for the ‘opening’ photos, 1 full length front, 1 full length back, 1 close up. Nearly all of my garments have that sequence when I list them, I do include designer labels if I can (I have a cute Sportrite reversible skirt with label right now: https://www.etsy.com/listing/95532569/sale50s-sportrite-plaidskirt-reversible). In some cases, if it is valuable, I have added additional photos to my flickr site. Want the label? just ask and you can have it sent to you in a convo. p.s. I don’t have photo shop, nor the time to spend making that edit (seriously, I spend waaay too long editing for color and light). It would be nice if Etsy gave us more pix AND portrait layout options, right? If I thought that all sellers knew their stuff, this would not be an issue, but unfortunately, that is not the case. I spotted that last label, the one from Walmart, in at least 7 etsy listings, and it is no older than 2004. As a former seller, I completely agree that 5 images is seldom enough. As a buyer I can tell you that I’m not likely to email and ask for more photos unless I’m very interested in an item. I takes me less than a second to establish “vintageness” if there is a photo, but if I have to take the time to convo and then wait for a reply, then often the urge to buy passes. I agree with you Lizzie. A label shot makes the buying process easier. Yes, and you said in 8 words what took me 412! you deserve a special reward for this information! It is very valuable. Good work! outstanding research information! Very valuable. Thanks! The Walmart info was surprising. I’m going to second what Jen said. I include a label shot for all of my items that have them. It’s not at all difficult to do, and takes under a minute to make a composite photo with the label. You don’t need Photoshop. I use the free Windows Paint that came with my computer. And Lizzie, like you, as a buyer, if the pertinent info isn’t in the listing, I’m unlikely to take the time to message the seller and wait for a reply, unless the item is something I REALLY want. And this brings me to *my* pet peeve: vintage sellers, please learn how to take proper measurements of your garments, and include these in your listings. I just purchased three collars on Etsy–one newly made, two vintage. The newly made collar was as advertised (unsurprisingly, seamstresses know how to measure!). Both vintage collars had measurements that did not match the description/seller’s info (despite my walking one of the sellers through how to measure it). Very disappointing. These Walmart labels have been haunting me today–It would seem to me that with the vintage label resource online, it’s possible to date many of the ‘big’ brands now. This makes me wonder: With the resources out there for dating vintage, If a vintage seller lists a recent product (like a Walmart brand) as vintage, is it fraud? On Etsy, the seller selects a decade when listing their vintage. Each seller must knowingly place their item in a decade prior to 1992. Isn’t it a deliberate misrepresentation of the fact to list an item less than 20 years old in an earlier decade? It’s hard to imagine that anyone who is a serious vintage seller has not run across the VFG Label Resource, but I get emails from people all the time saying they just found it. I think there has to be a big clueless factor in many cases, especially when the label is clearly shown in the listing. It’s the ones where the label is obscured that are worrisome. Do I think there is deliberate misrepresentation of age of clothing on etsy? Absolutely, and I’m sure the same is true of any online vintage selling site with large numbers of sellers. i heard that label shots could also be stolen, just like showing receipt doesn’t help authenticate the item. i know the comparison is weak, but i hope you get what i’m trying to say. I do get it. That’s really scummy.